Looking For A Natural Remedy For Acne? You’ll be hard-pressed to find an all-natural product in the selection of over-the-counter acne treatments available on the market. These cleansers, creams, toners and spot applications contain countless chemicals that are harsh on the skin and can have harmful side effects to your health. And KidsHealth.org explains that using too much of the common acne fighters benzoyl peroxide and salicylic acid can cause more acne. Even worse, a doctor might prescribe you medication that can throw off your body’s natural systems and cause unhealthy side effects. Instead, try apple cider vinegar, which is safe enough to eat. This natural ingredient can provide acne-fighting benefits to clear your skin safely and healthily. Apple cider vinegar is a completely natural ingredient that is much less likely to have harmful effects on your body than the harsh and potentially dangerous chemicals found in mainstream skin products. This type of vinegar is made from apples that are broken down through fermentation. Microorganisms turn the sugar from the fruit into alpha hydroxy acids, which are the main acne-fighting components in apple cider vinegar. In addition to the acid, vinegar also contains water, vitamins and mineral salts. Your skin has a natural acid mantle that wards off the germs and pollution it is exposed to daily. Many cleansers and skin products affect the acidity of your skin, weakening its ability to protect against outside forces. But the acid in apple cider vinegar can help balance the skin’s natural acidity to ensure that it has protection. Besides, the components within apple cider vinegar can remove substances like makeup and dirt from your skin, break down dead skin cells and attack bacteria. Apple cider vinegar cleanses and naturally balances your skin. Apple cider vinegar might also help your skin if you ingest it, although any vinegar can provide the same benefit when used in this way. Acne Einstein explains that the acetic acid in vinegar can control insulin levels in the body, which can help balance hormones involved in acne formation. However, the website notes that more research is needed to confirm vinegar’s potential effects on acne. Any type of apple cider vinegar will have some of the properties that can help improve acne. Nonetheless, you will have the best results if you use organic apple cider vinegar that has not been pasteurized or filtered. It should also contain the “mother,” which is a strand inside the vinegar that is created by bacteria. It will not harm you, but you can strain it out if you prefer. 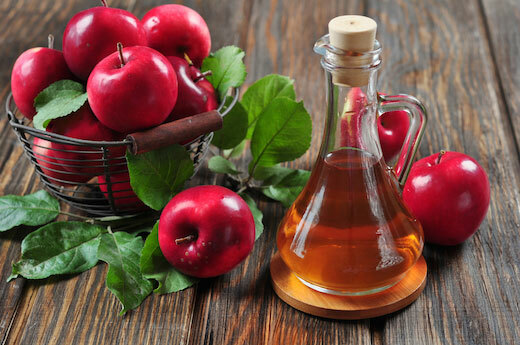 Apple cider vinegar provides acne-fighting benefits as a facial toner. To create the toner, mix the vinegar with water using a balance of two to three times more water than vinegar. When you’re ready to use it, first wash your face with a gentle and natural cleanser. Then, apply the toner to your face with a cotton ball and do not wash it off. Once it’s dry, you can use moisturizer or other products if you choose. Even though apple cider vinegar is natural, your skin might react to it. Because of that, you should start with a mixture of much more water than vinegar to see how your skin reacts. After that, you can try more vinegar if needed. If you want to use apple cider vinegar to try to balance your insulin levels, you should ingest the vinegar. Measure out one tablespoon and drink it once a day. If you don’t like the taste, try mixing it with some juice or food. You might want to take it when you are going to eat a large portion of carbohydrates since it helps your body process carbs more slowly to prevent insulin spikes.